A refrigerant detector is one of the best tools any HVAC technician will own. 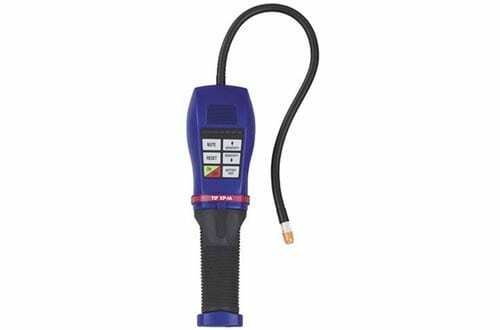 However, it is also a great tool for DIY fanatics that want to check for leaks in any HVAC system. 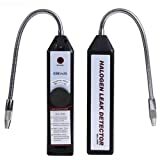 These leak detectors are a great way to detect leaks as people move away from the traditional method of using liquid bubbles to detect leaks. 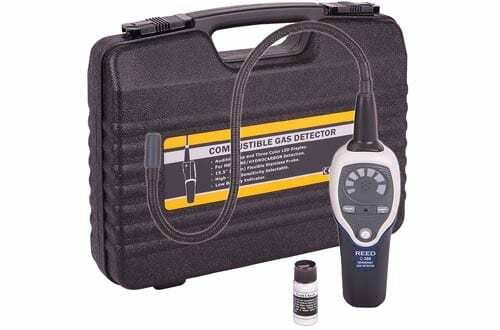 Discovering a refrigerant leak in the past was quite difficult, but that has tremendously changed over the years with the introduction of refrigerant leak detectors. These detectors can help discover even the smallest leaks that are hard to discover through traditional methods that consume a lot of time. 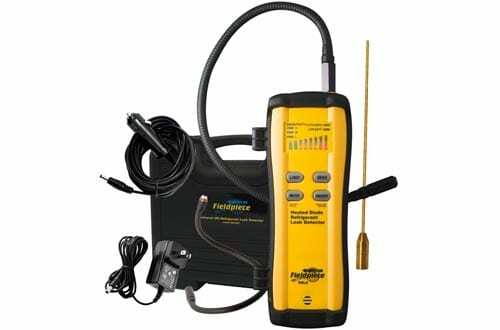 However, buying a refrigerant leak detector is not an easy thing as the market is filled with different brands and models. This article aims at helping you make the right selection by narrowing down your search to only the best models. Read on and find one that works best for your HVAC system. The Signstek comes with an excellent sensor that detects all forms of halogenated refrigerant gas leakage. 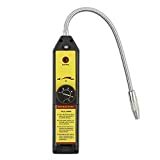 The detector comes with a long 14-inch flexible stainless steel probe that can reach the tightest space of your HVAC system. There is also a single color LED that shows you a 6-leak alarm just in case there is a leak. This is a cheap option that senses leaks well and can be reset with ease. The Inficon is one of the best refrigerant detectors on the market with a great level of sensitivity. It is neither too sensitive nor way too far away from sense. It’s perfect senses of a leak and pinpoints the location. 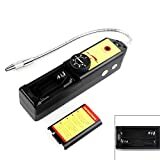 The electrochemical sensor in this unit works well with a ceramic substrate and a reactive element and that is maintained at high temperatures. There are no exaggerated responses here making this unit a good purchase. This is a more sensitive detector than others that trigger on all HCFCs, HFCs and CFCs. It uses a replaceable battery that can serve you for two full working days after the battery is recharged 15 h. The detector comes with a filter system that helps prevent the sensor from the damage of moisture and other contaminants. Manual and automatic zeroing help give the users pinpoint the exact location of the leaks. This is a very great refrigerant detector that is easy to use and operate. It starts first and will be up running in just 30 seconds. The TIFXP Robinair is UL listed, and SAE approved refrigerant detector with a true mechanical pump. It is a great pick and works efficiently sending a positive airflow through the sensing tip to help identify any leaks with ease. It comes with a 14-inch stainless steel probe that is highly flexible to pass through the tightest places. 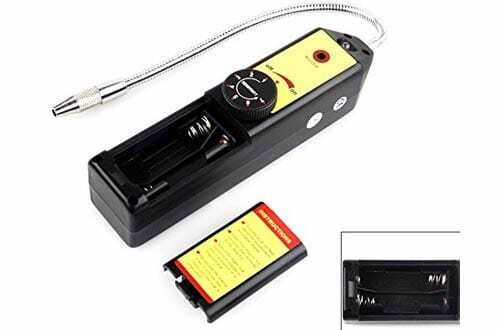 This is a very sensitive and easy to use the detector that will help save any future problems with your HVAC systems. The HDE is one of the most advanced refrigerant leak detectors out there that recognizes all halogen HVAC system leaks with ease. 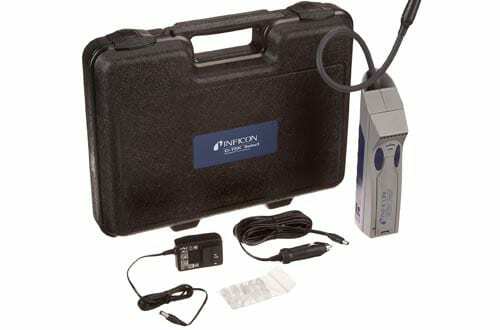 The sensitivity of this detector can be adjusted anytime and set to detect any leaks automatically. 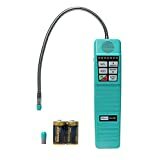 The neck of the detector is flexible and allows it to get into tight places and detect leaks with ease. It is powered by the 4xAAA batteries that make it highly portable. This is a cordless refrigerant which means it is highly portable and can be used at different places without being held back by the cord. 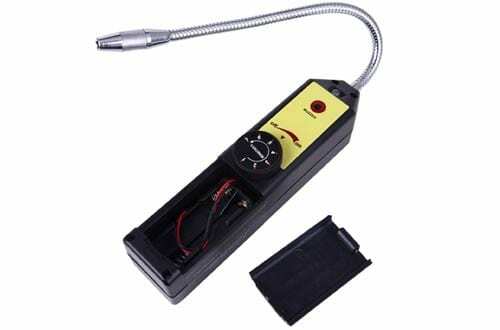 It is a highly sensitive detector that gives accurate leaks pinpointing the exact location of the leaks with the highest levels of precision. It is a versatile pick that works well with almost all types of refrigerants. The unit is highly durable and the highest Inficon standards. The D-TEK Inficon is a versatile pick and one that is easy to use making it a good purchase. The CISNO is a good pick for detecting all 134a CFC&HFC refrigerants to the highest precision levels. 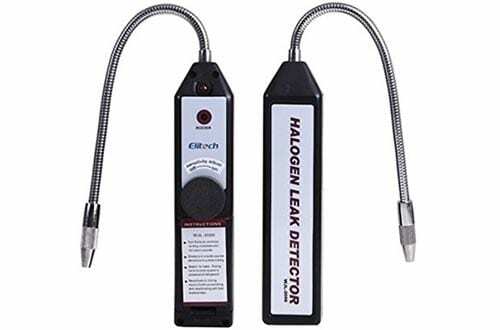 When a leak is found, the detector gives an audio siren to alert the user of any leaks. There is a further reset function that gives users the ability to reset the meter and ignore any ambient halogen concentrations. It is a versatile choice to detect leaks in your entire HVAC system, and fittings help solve any issues before they worsen. 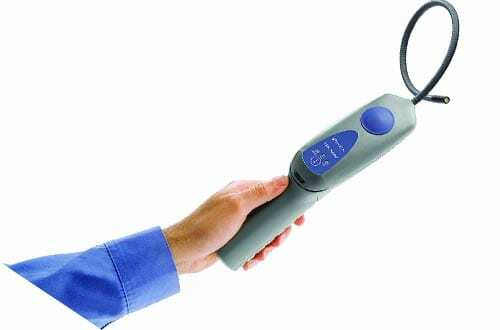 The REED detector is a versatile pick that works for HFCs, CFCs and HCFCs precisely detecting leaks and notifying the user early enough to make necessary repairs. The gooseneck for this detector is long 15 inches and highly flexible to reach the hard to get areas. The sensitivity of the detector can easily be adjusted from high to low with the detector giving a siren alarm when there are leaks. 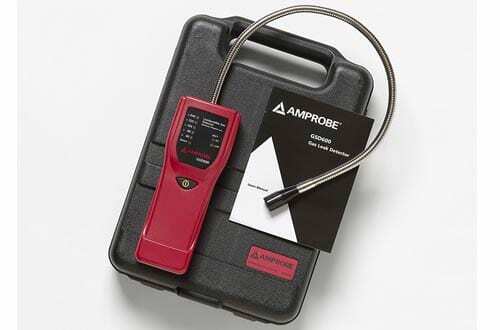 The Amprobe is a good detector for noting small leaks in piping systems using the long flexible cord. The semiconductor senses both the propane and methane gas with ease. The stainless steel cable is long and manoeuvres its way into those hard-to-reach areas. The audio buzzer will alert you in the case of leaks with the LEDs indicating the exact position of the leaks. The accuracy in this unit is one of the best, and this is enabled through the use of automatic calibration. The HDE takes the number one spot on our list detecting leaks with very high accuracies. 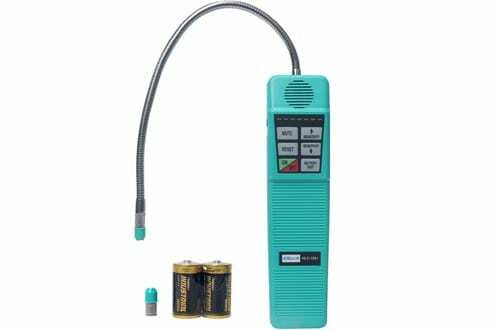 The detector is one of the best in the market and comes with advanced features that make it detect for all halogens Freon, CFCs, HFCFs and HFC refrigerants. The sensor is usually attached to an adjustable neck that allows it to get to those tight areas.